Kibbutzim (the plural of kibbutz) are cooperative communities in Israel. There are around 270 kibbutzim across the country today, with an average membership of 500-600. In the early 20th century, the first kibbutzim were agricultural settlements founded by Jews from Eastern Europe, who came on a Zionist mission to claim and connect with their ancient homeland. They were pioneers, making barren, swampy land hospitable and productive for the millions of Jews to come. 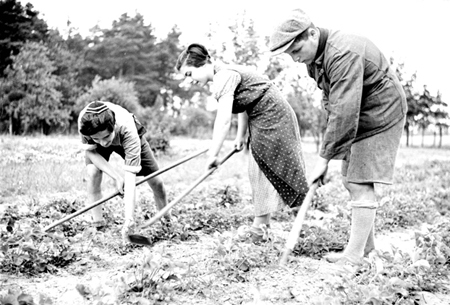 Kibbutzim were founded on socialist principals, with joint ownership of property and means of production, cooperative work, sharing of resources and equality. Direct democracy gave all members a say in policy, budget allocation and elections of leaders. There was no need for money in daly life, everyone contributed based on their ability and was in turn supported by the community, according to their needs. All meals were served in communal dining halls. Children grew up together, in separate quarters from their parents. In the 1980s the kibbutz model really began to fail. The larger Israeli society was moving away from socialism, the economy was bad and there was less financial support coming from the government. Once highly respected as the pioneering foundation of the country, kibbutzim became irrelevant to the outside world. Young people left. While about 30% of kibbutzim have managed to maintain their original, socialist way of life and thrive. Today most have adapted by blending the social idealism of their founders with more practical economics. Agriculture remains an important means of income and kibbutzim still supply Israel with a significant portion of its food but their economies have become much more diversified, with industry from high tech to tourism (some of our tours include kibbutz stays). Adult members earn salaries, which vary according to the type of work they do, they own their homes, children live with their parents, meals are eaten at home. However, the spirit of community and cooperation is still very much alive, setting the modern kibbutz apart from other rural villages and attracting new and returning members to such a degree that many kibbutzim have long waiting lists. This entry was posted in Israel by yalla2013. Bookmark the permalink.